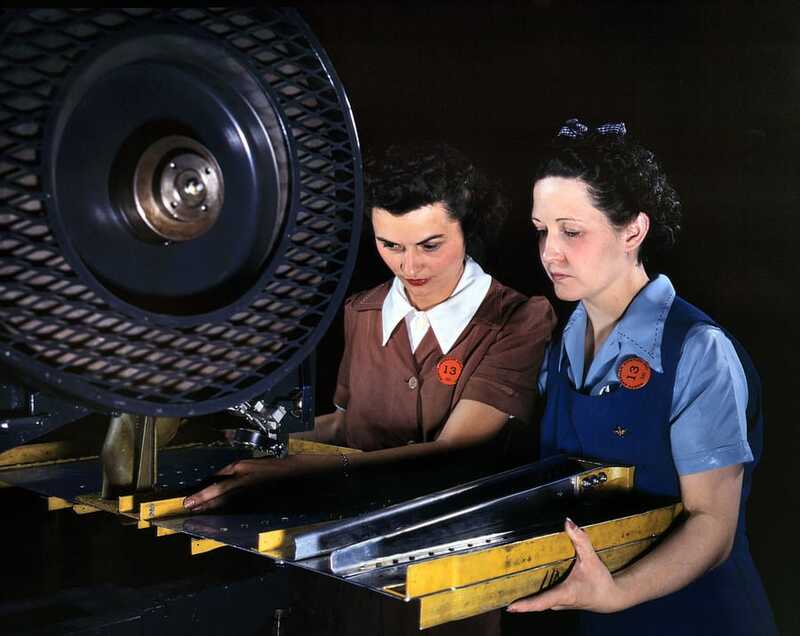 From 1940 to 1945 working women had rose from 25% to 35% of the workforce. By the end of the war, approximately one of four married women worked outside the home. 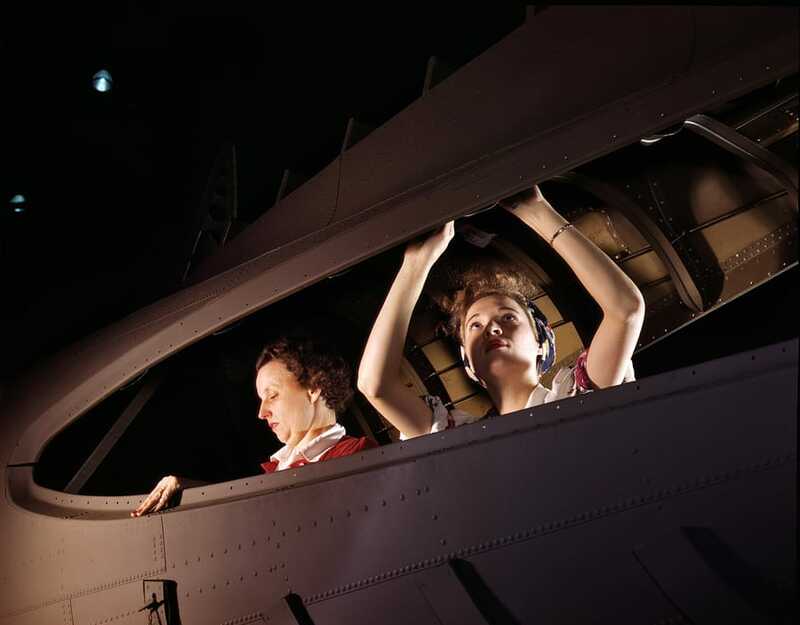 In 1943, nearly 310,00 women were working the in U.S. aircraft industry alone. 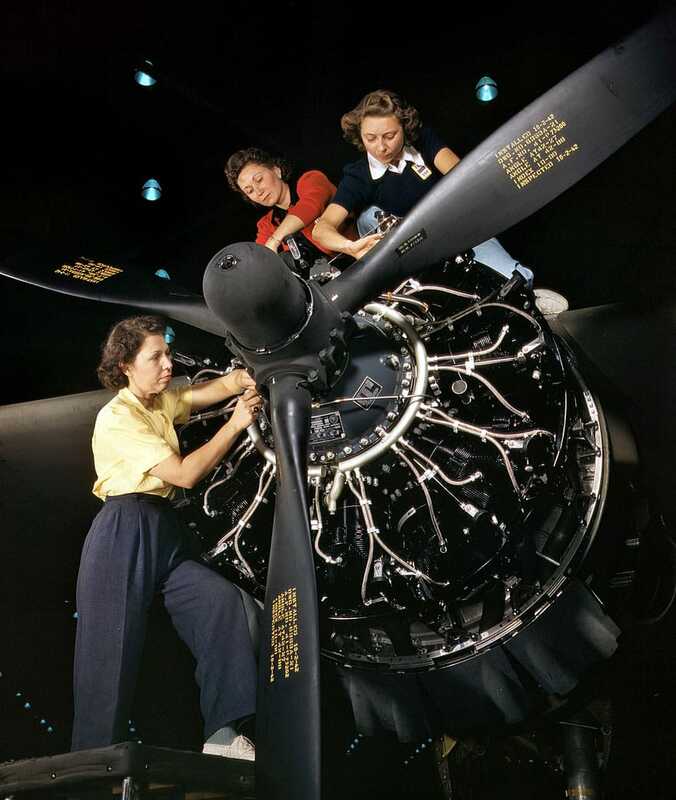 Part of the cowling for for a B-25 bomber is assembled in the engine department of North American Aviation’s Inglewood plant. C. & N.W. R.R. 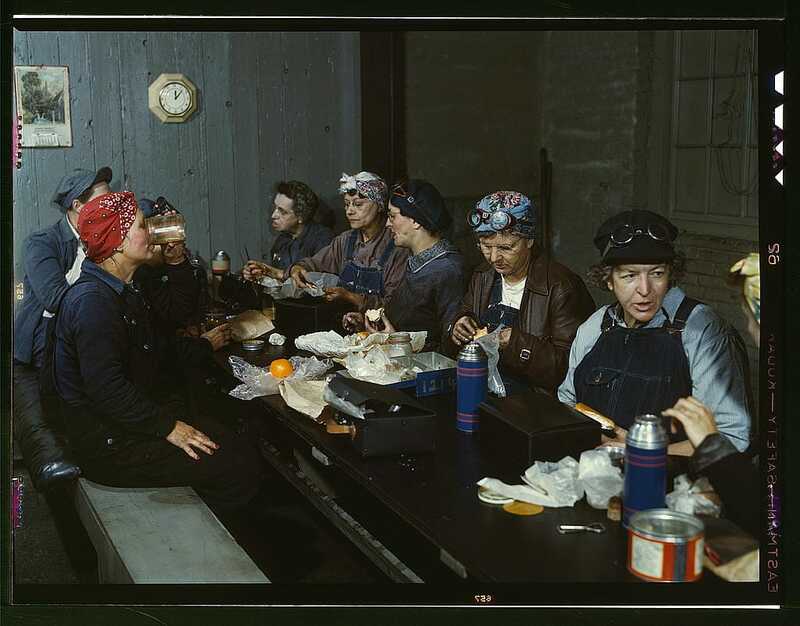 Cloe Weaver, mother of four children, employed as a helper at the roundhouse, Clinton, Iowa. 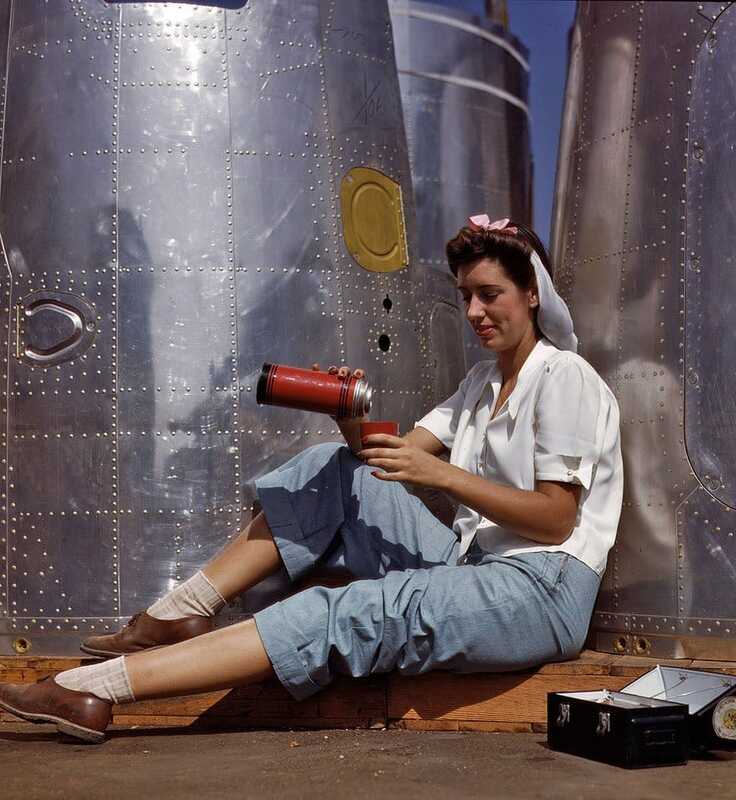 Frances Eggleston,23, from Oklahoma working on the nose of an airplane. Mary Louise Stepan, 21, used to be a waitress. She has a brother in the Army Air Corps. She is working on parts in the hand mill. 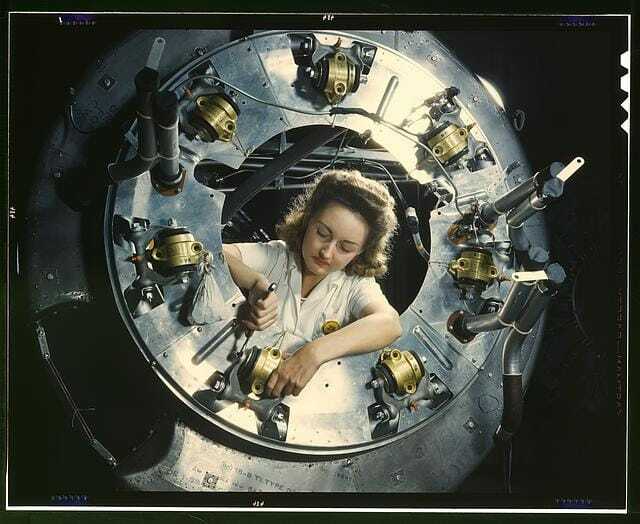 Operating a hand drill at Vaultee-Nashville, woman is working on a Vaultee Vengeance dive bomber at the Nashville Tennessee plant. 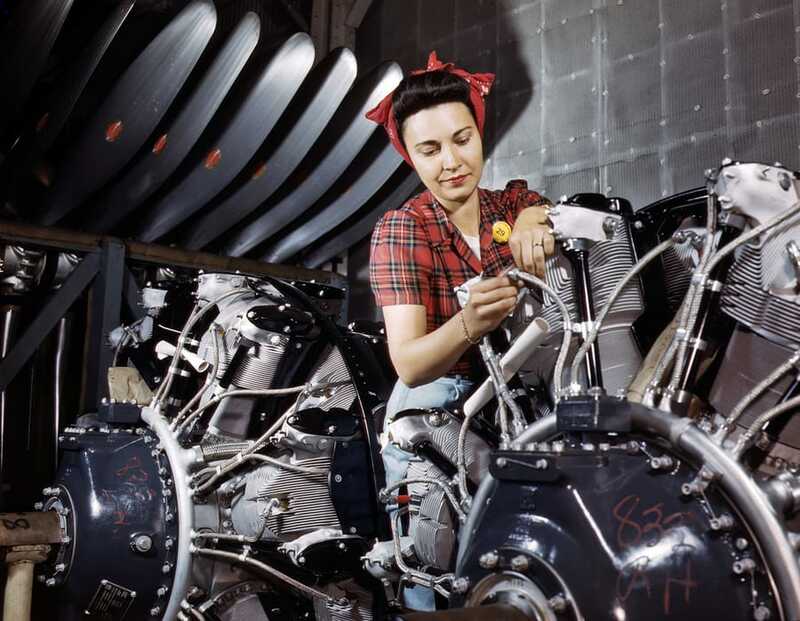 Rosie the Riveter hard at work. 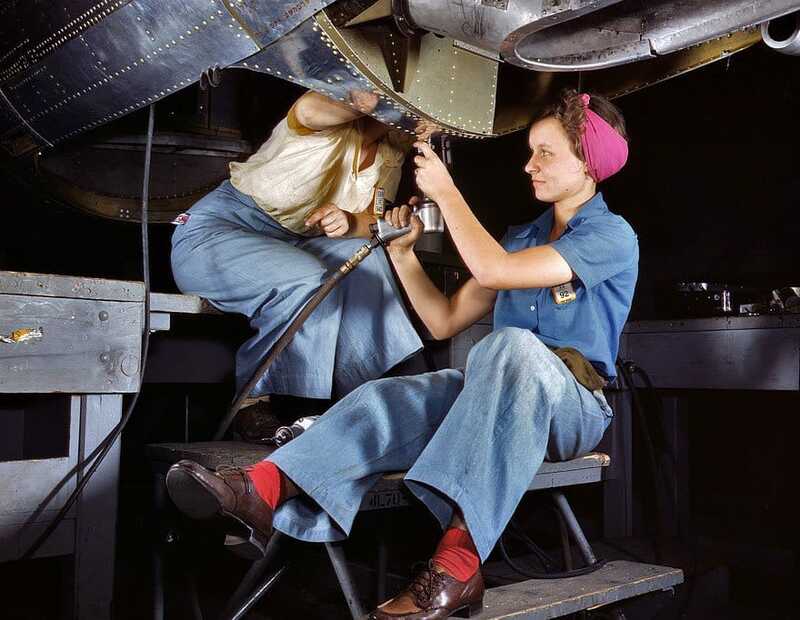 Rosie the Riveter working on a Consolidated B-24 bomber, Consolidated Aircraft Corp., Fort Worth, Texas. 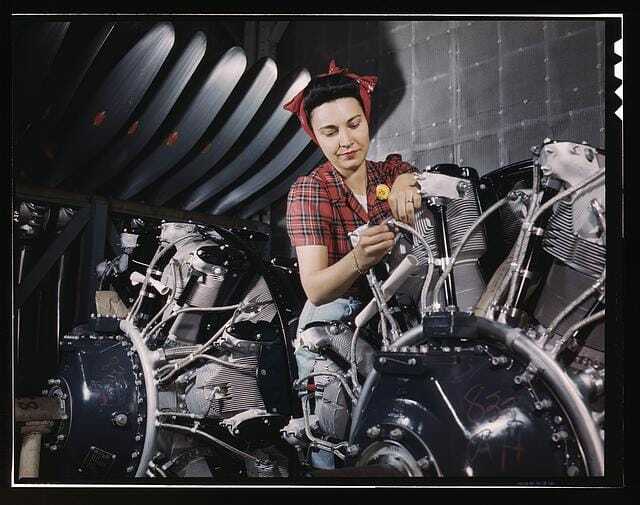 Rosie working on an radial engines at North American Aviation, Inc., plant in California. Rosie having lunch on their lunch break. Rosie riveting the tail section of an airplane. ALL PHOTOS LIBRARY OF CONGRESS. 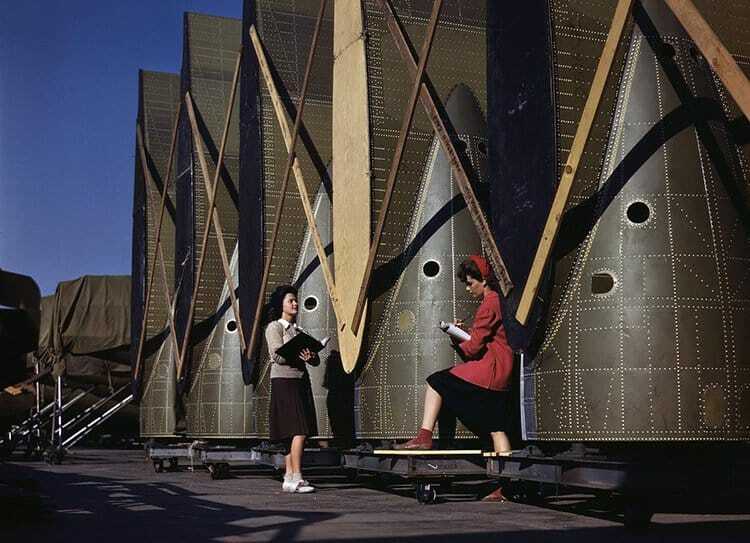 WWII Color Kodachrome pictures from the Office of War Information (OWI). These photographs were taken between September 1940 and April 1943. September 1940. Jack Whinery, Pie Town, New Mexico, homesteader, with his wife and the youngest of his five children in their dirt-floor dugout home. 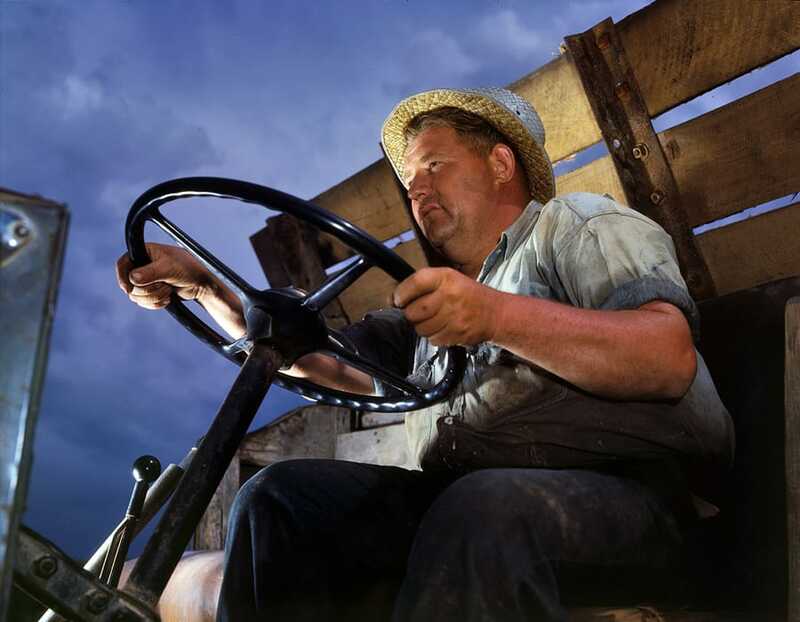 Whinery homesteaded with no cash less than a year ago and does not have much equipment; consequently he and his family farm the slow, hard way, by hand. Main window of their dugout was made from the windshield of the worn-out car which brought this family to Pie Town from West Texas. 4×5 Kodachrome transparency by Russell Lee, Farm Security Administration. 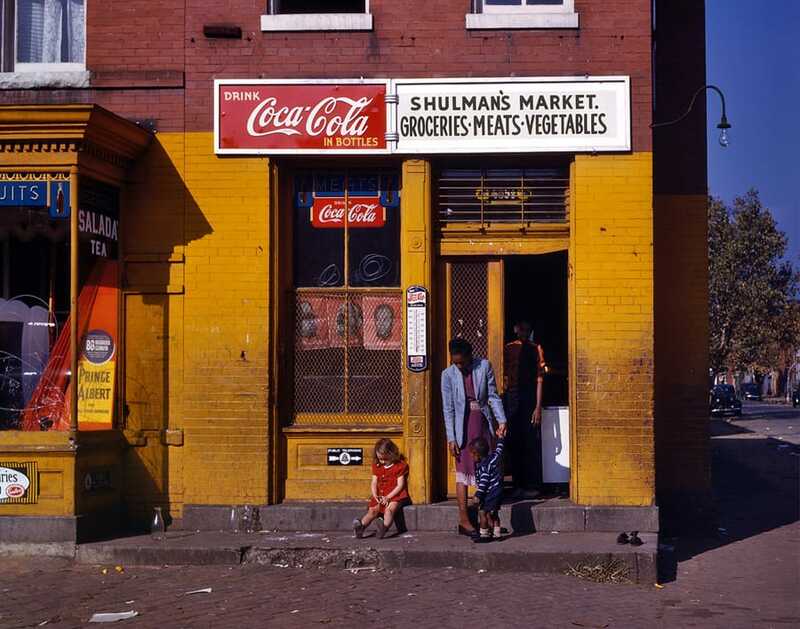 Shulman’s Market at N and Union Street SW, Washington. 4×5 Kodachrome transparency by Louise Rosskam. Alternate view. In one of the many comments for this post, an alert FOS (Friend of Shorpy) points out the posters of Axis leaders Mussolini, Hitler and Admiral Yamamoto in the window. Along the bottom of each it says What do YOU say America? May 1942. Langley Field, Virginia. YB-17 bombardment squadron. “Hitler would like this man to go home and forget about the war. 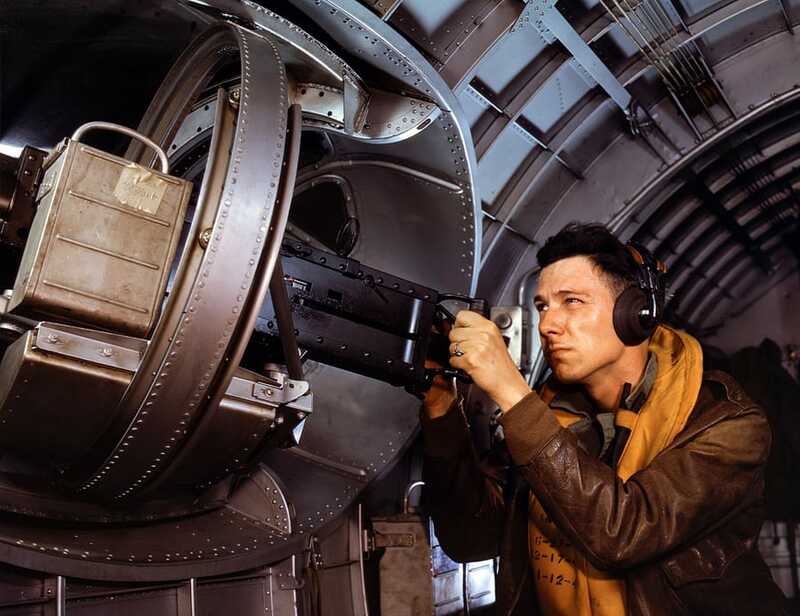 A good American non-com at the side machine gun of a huge YB-17 bomber is a man who knows his business and works hard at it.” 4×5 Kodachrome transparency by Alfred Palmer. Fort Knox, June 1942. 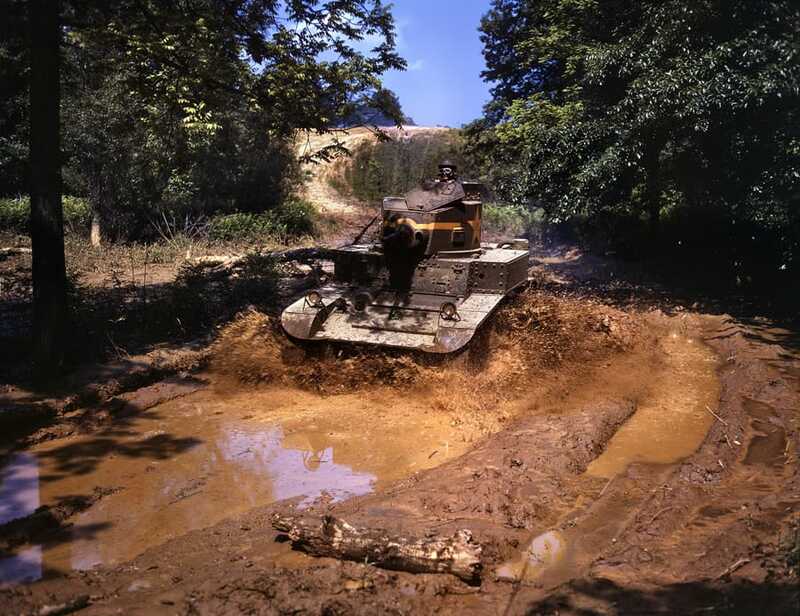 “Light tank going through water obstacle.” 4×5 Kodachrome transparency by Alfred Palmer, Office of War Information. June 1942. Crane operator at Tennessee Valley Authority’s Douglas Dam. 4×5 Kodachrome transparency by Alfred Palmer for the OWI. June 1942. Engine inspector for North American Aviation at Long Beach, California. 4×5 Kodachrome transparency by Alfred Palmer. June 1942. Fort Knox, Kentucky. “Infantryman with halftrack. 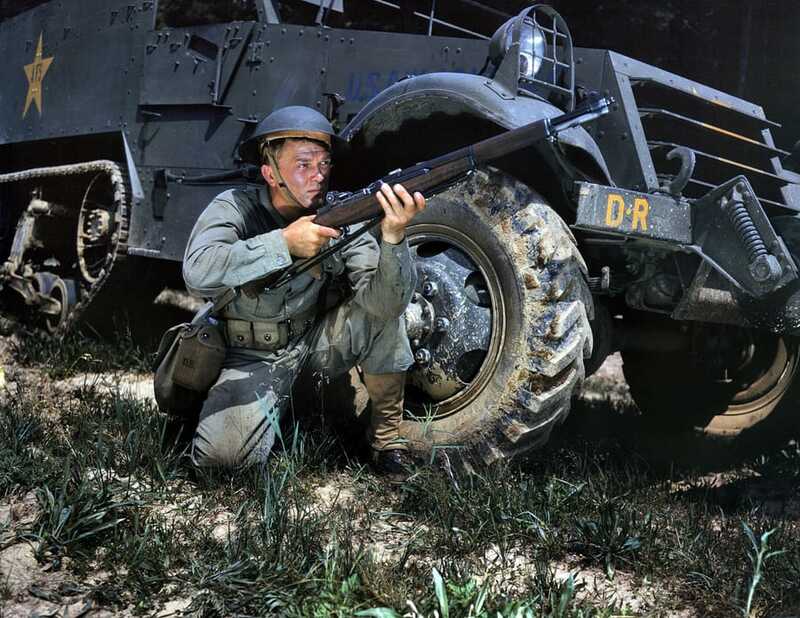 A young soldier sights his Garand rifle like an old-timer. He likes the piece for its fine firing qualities and its rugged, dependable mechanism.” 4×5 Kodachrome transparency by Alfred Palmer for the Office of War Information. June 1942. Inglewood, California. 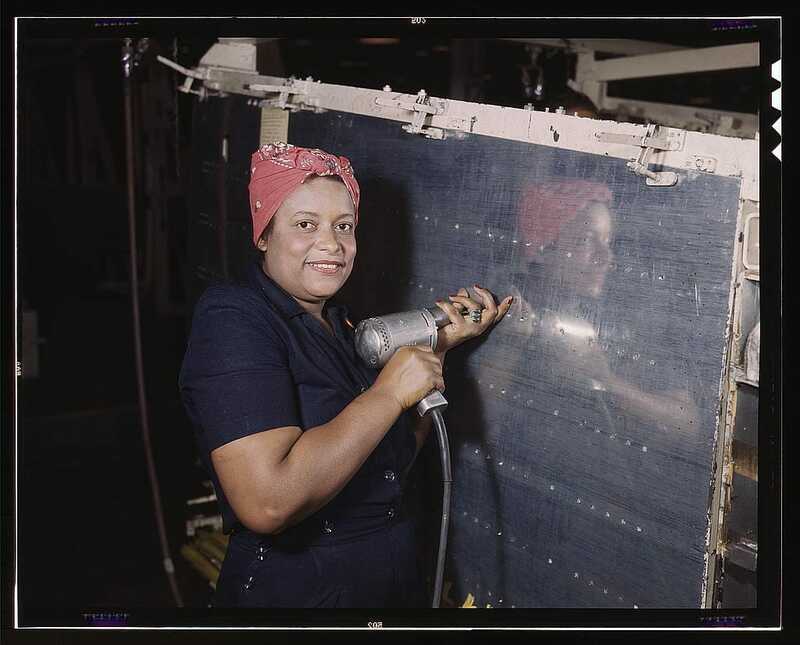 “Punching rivet holes in a frame member for a B-25 bomber at North American Aviation.” 4×5 Kodachrome transparency by Alfred Palmer for the Office of War Information. June 1942. Lockheed Vega aircraft plant at Burbank, California. 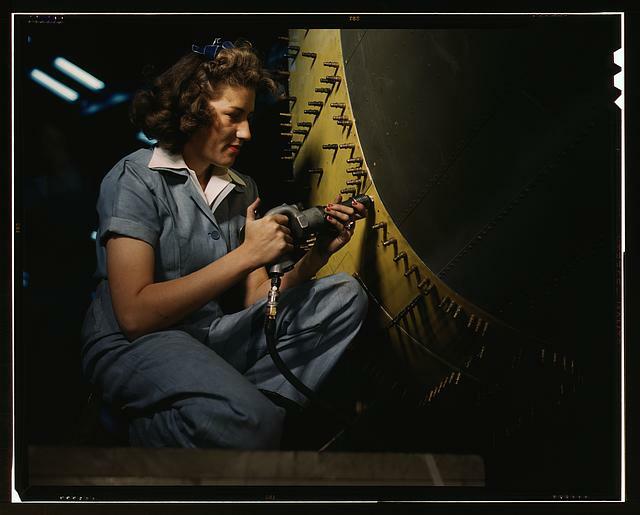 “Hollywood missed a good bet when they overlooked this attractive aircraft worker, who is shown checking electrical sub-assemblies.” 4×5 Kodachrome transparency by David Bransby for the Office of War Information. June 1942. Truck driver at the Tennessee Valley Authority’s Douglas Dam. Amazing 4×5 Kodachrome transparency by Alfred Palmer. August 1942. Corpus Christi, Texas. “After seven years in the Navy, J.D. 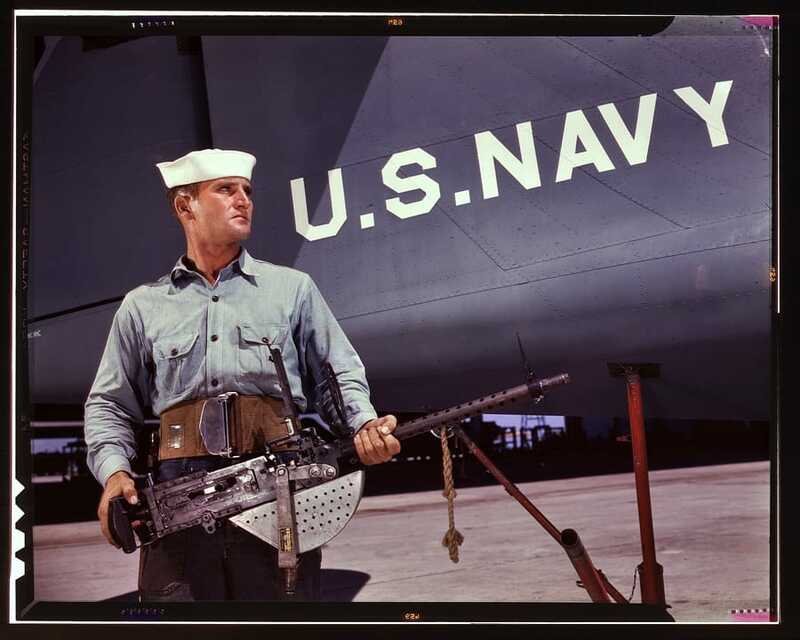 Estes is considered an old sea salt by his mates at the Naval Air Base.” 4×5 Kodachrome transparency by Howard Hollem, Office of War Information. August 1942. 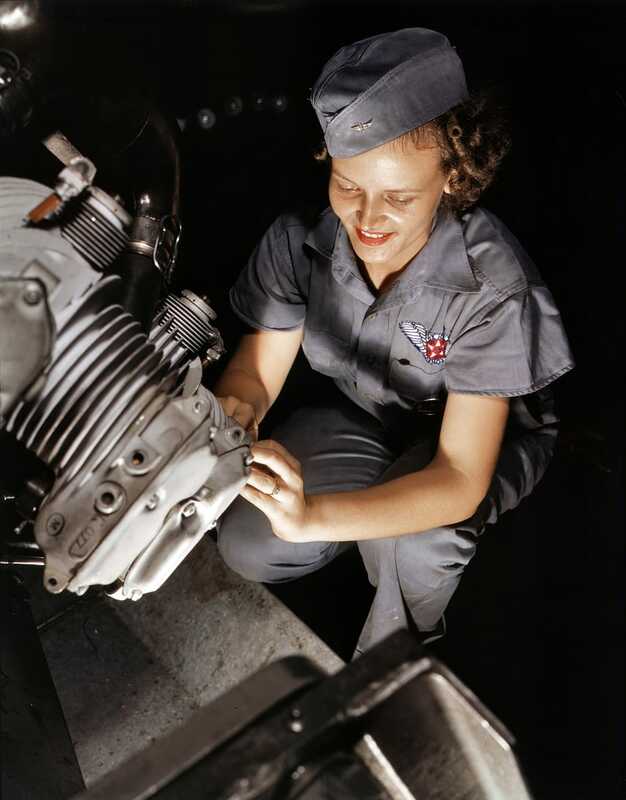 Mechanic Mary Josephine Farley works on a Wright Whirlwind motor in the Corpus Christi, Texas, Naval Air Base assembly and repairs shop. 4×5 Kodachrome transparency by Howard R. Hollem. September 1942. Inglewood, California. Riveting team working on the cockpit shell of a C-47 heavy transport at North American Aviation. “The versatile C-47 performs many important tasks for the Army. 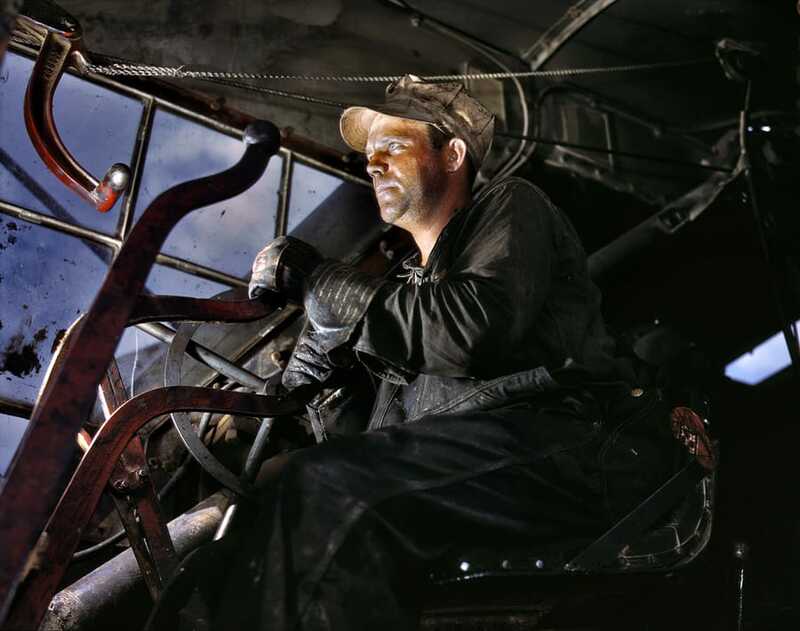 It ferries men and cargo across the oceans and mountains, tows gliders and brings paratroopers and their equipment to scenes of action.” 4×5 Kodachrome transparency by Alfred Palmer for the Office of War Information. Long Beach, California. October 1942. 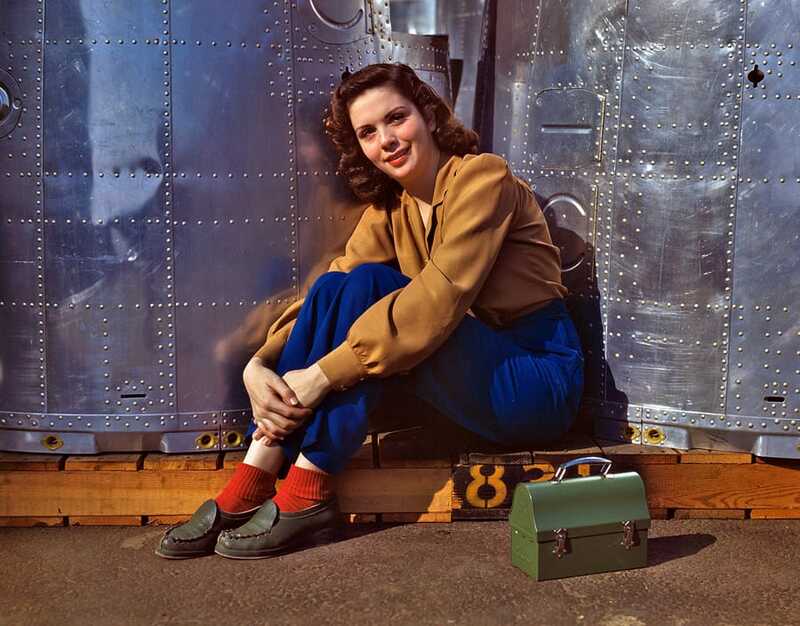 “Annette del Sur publicizing salvage campaign in yard of Douglas Aircraft Company.” 4×5 Kodachrome transparency by Alfred Palmer for the Office of War Information. October 1942. 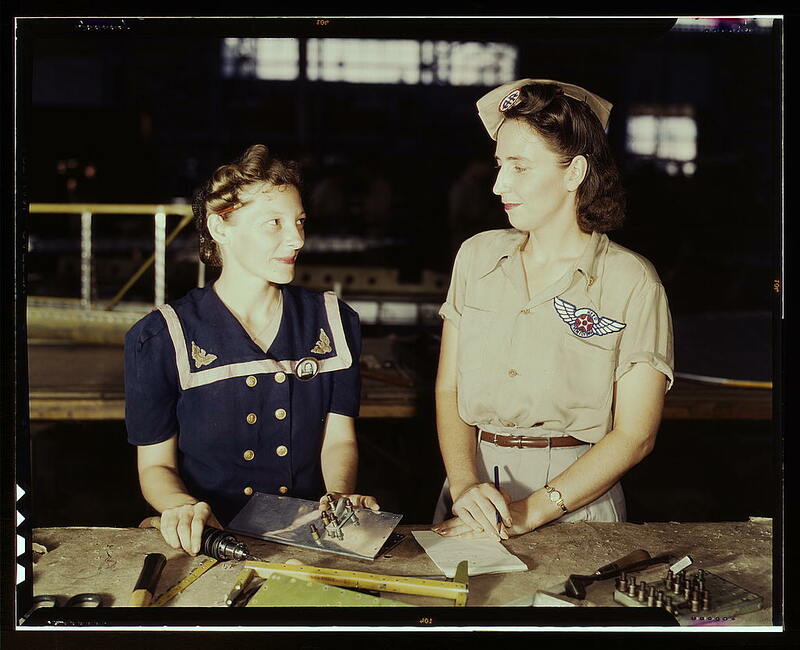 “American mothers and sisters, like these women at the Douglas Aircraft Company plant in Long Beach, California, give important help in producing dependable planes for their men at the front.” 4×5 Kodachrome transparency by Alfred Palmer for the Office of War Information. October 1942. 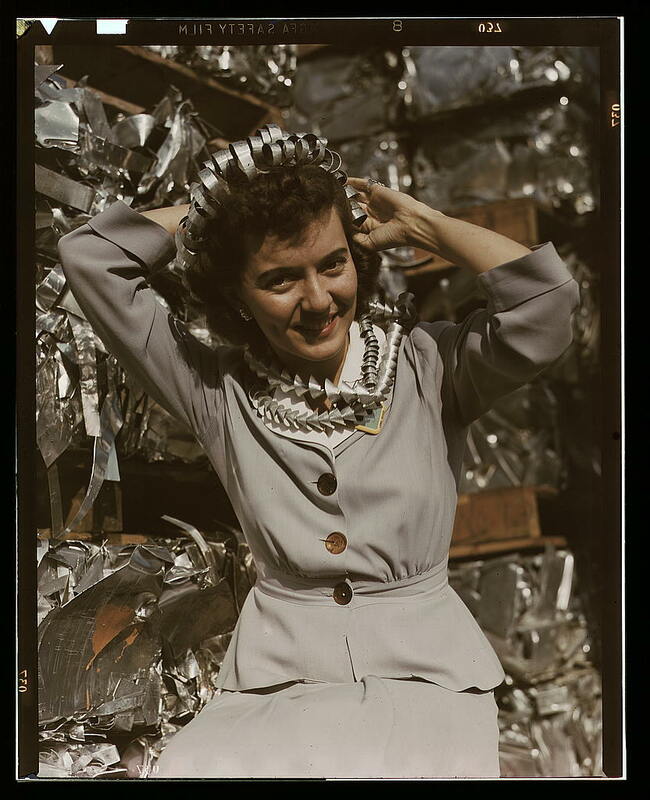 “Noontime rest for an assembly worker at the Long Beach, Calif., plant of Douglas Aircraft Company. Nacelle parts for a heavy bomber form the background.” 4×5 Kodachrome transparency by Alfred Palmer. October 1942. 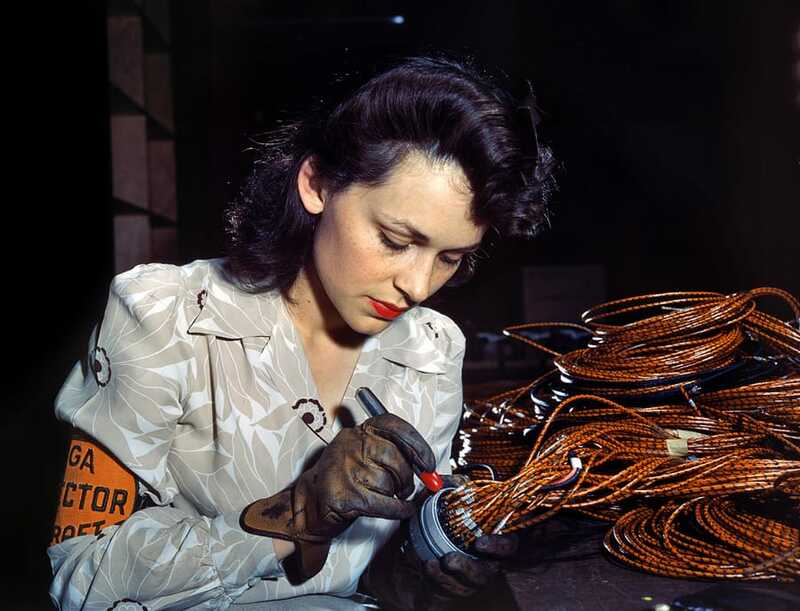 “Testing electric wiring at Douglas Aircraft Company. Long Beach, California.” 4×5 Kodachrome transparency by Alfred Palmer. October 1942. 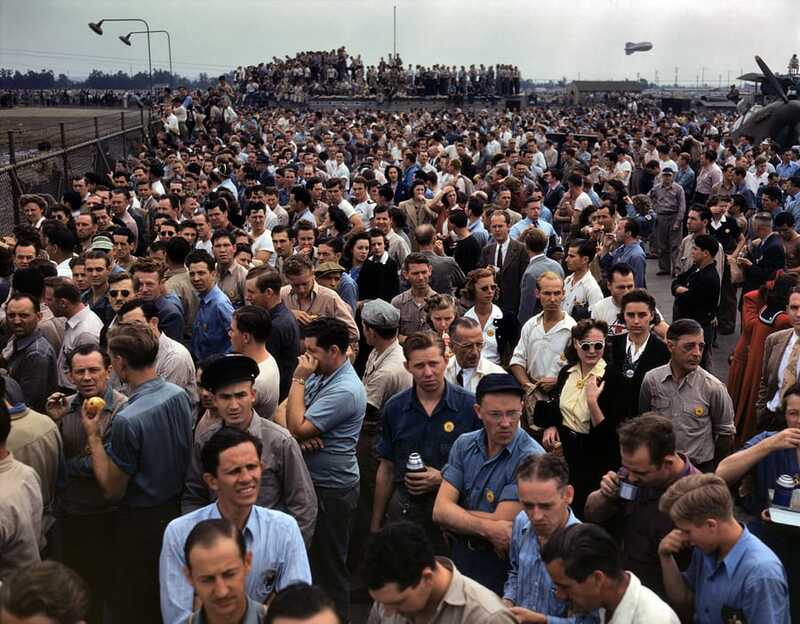 “Thousands of North American Aviation employees at Inglewood, California, look skyward as the bomber and fighter planes they helped build perform overhead during a lunch period air show. This plant produces the battle-tested B-25 ‘Billy Mitchell’ bomber, used in General Doolittle’s raid on Tokyo, and the P-51 ‘Mustang’ fighter plane, which was first brought into prominence by the British raid on Dieppe.” 4×5 Kodachrome transparency by Alfred Palmer for the Office of War Information. October 1942. 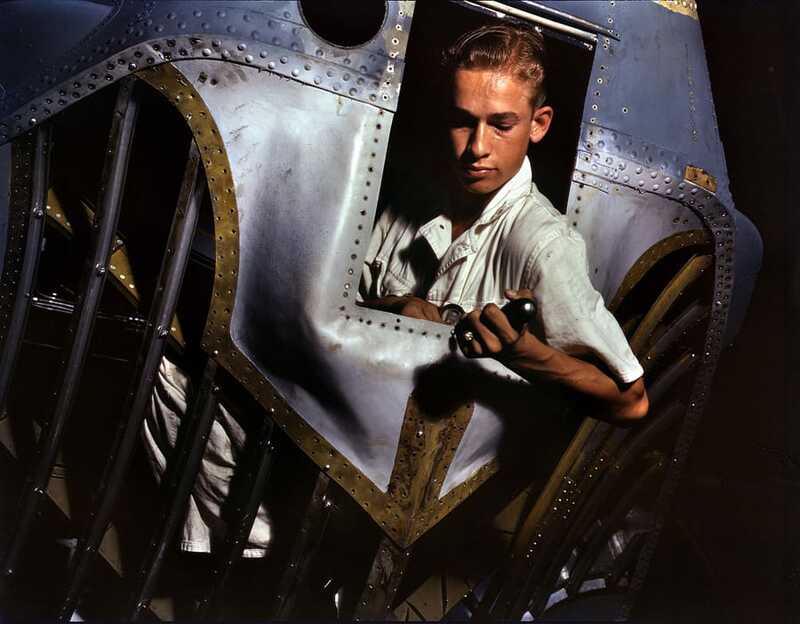 Assembling switchboxes on the firewalls of B-25 bombers at North American Aviation’s Inglewood, California, factory. 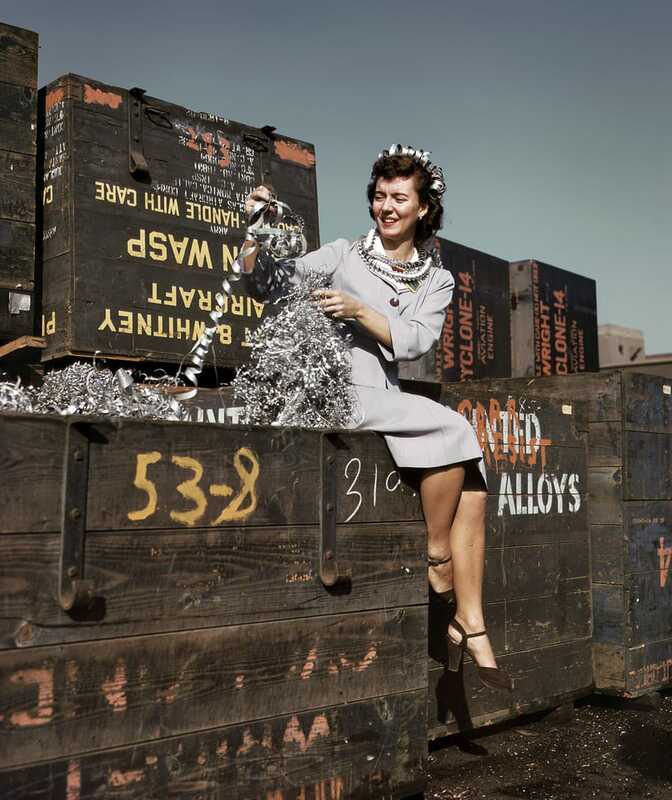 4×5 Kodachrome transparency by Alfred Palmer, Office of War Information. October 1942. Engine installers at Douglas Aircraft in Long Beach, California. 4×5 Kodachrome transparency by Alfred Palmer. October 1942. Glenview, Illinois. 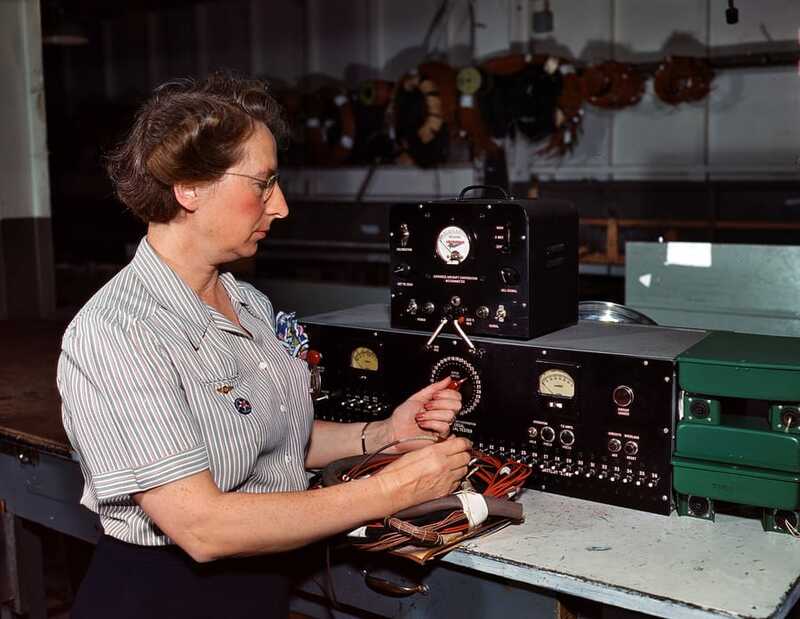 “Transfusion bottles containing intravenous solution are given final inspection by Grace Kruger, one of many women employees at Baxter Laboratories. 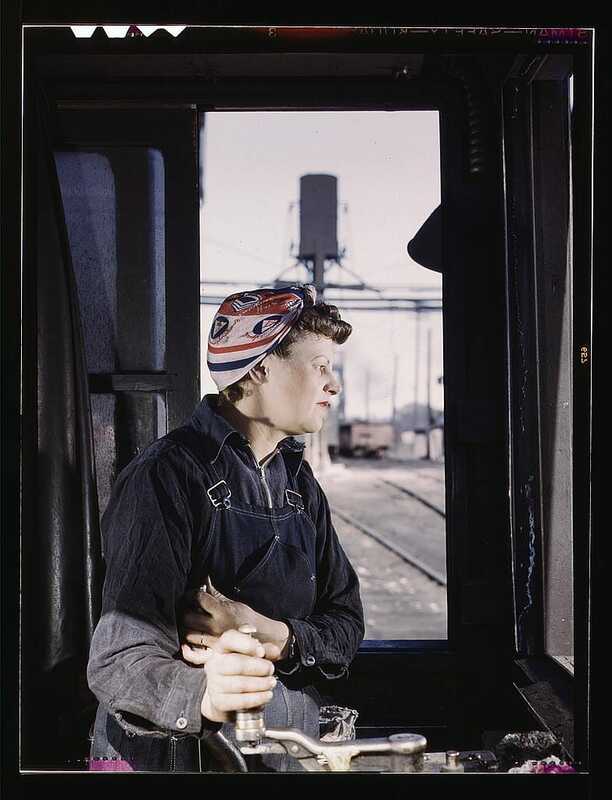 When her brother left Baxter to join the Merchant Marine, Miss Kruger, a former life insurance clerk, took his place.” 4×5 Kodachrome transparency by Howard R. Hollem for the OWI. October 1942. Inglewood, California. 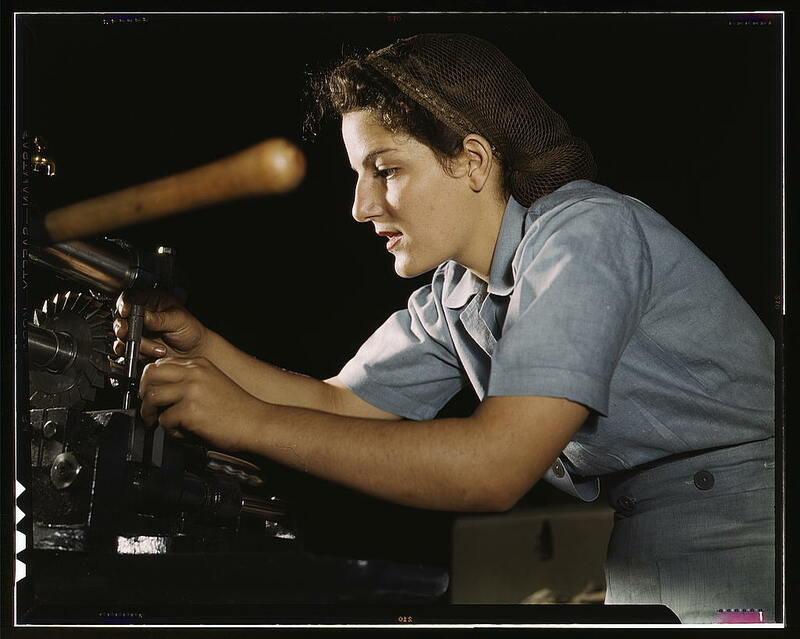 “Young woman employee of North American Aviation working over the landing gear mechanism of a P-51 fighter plane.” 4×5 Kodachrome transparency by Alfred Palmer. October 1942. Inglewood, California. 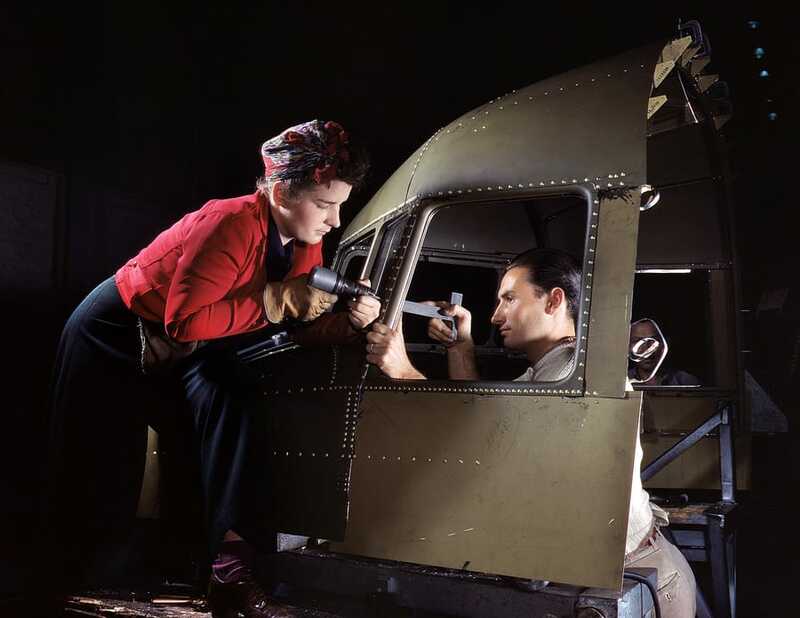 North American Aviation drill operator in the control surface department assembling horizontal stabilizer section of an airplane. 4×5 Kodachrome transparency by Alfred Palmer. October 1942. Kansas City, Kansas. “B-25 bomber plane at North American Aviation being hauled along an outdoor assembly line.” 4×5 Kodachrome transparency by Alfred Palmer for the Office of War Information. October 1942. 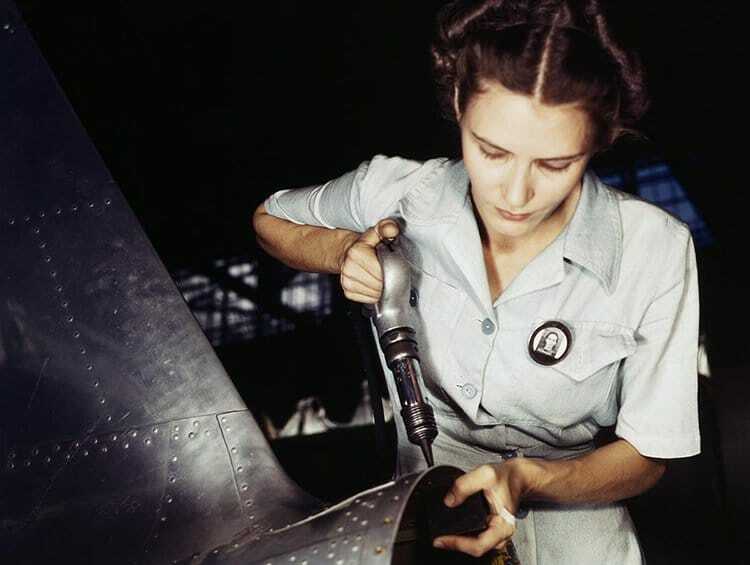 Riveter at work on a bomber at the Consolidated Aircraft factory in Fort Worth. 4×5 Kodachrome transparency by Howard Hollem. October 1942. 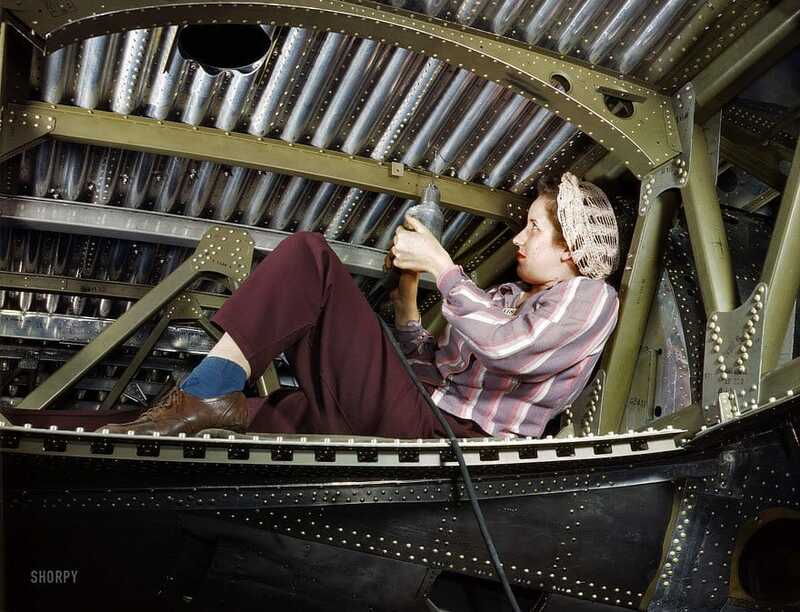 Workers installing fixtures and assemblies in the tail section of a B-17F bomber at the Douglas Aircraft Company plant in Long Beach, California. 4×5 Kodachrome transparency by Alfred Palmer. December 1942. A winter afternoon in the North Proviso yardmaster’s office, Chicago & North Western Railroad. 4×5 Kodachrome transparency by Jack Delano. Click here for a closeup of the poster on the wall. December 1942. Three West Coast streamliners in the Chicago & North Western yards at Chicago. 4×5 Kodachrome transparency by Jack Delano. February 1943. Lucille Mazurek, age 29, ex-housewife, husband going into the service. Working at the Heil and Co. factory in Milwaukee on blackout lamps to be used on Air Force gasoline trailers. 4×5 Kodachrome transparency by Howard R. Hollem for the Office of War Information. February 1943. 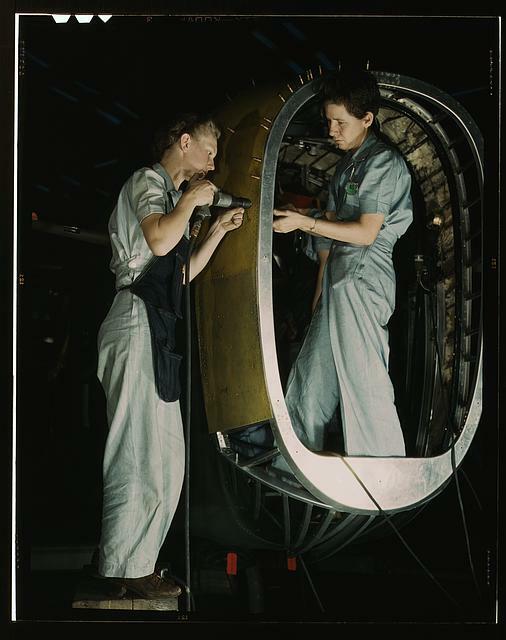 Working on the horizontal stabilizer of a “Vengeance” dive bomber at the Consolidated-Vultee plant in Nashville. 4×5 Kodachrome transparency by Alfred Palmer for the Office of War Information. March 1943. “Santa Fe R.R. shops, Albuquerque. Hammering out a drawbar on the steam drop hammer in the blacksmith shop.” 4×5 Kodachrome transparency by Jack Delano for the Office of War Information. March 1943. Yardmaster at Amarillo, Texas, rail yard. 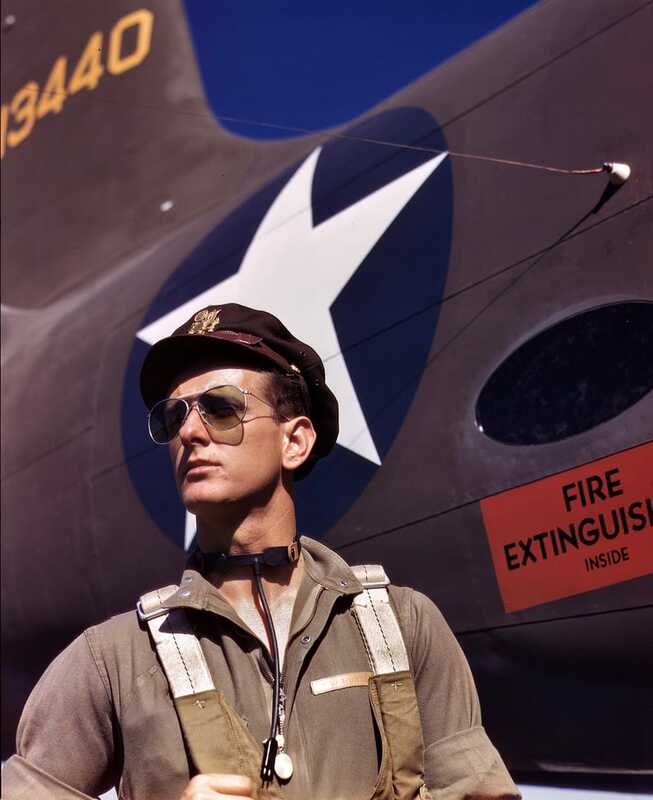 4×5 Kodachrome transparency by Jack Delano, Office of War Information. April 1943. “Mrs. Thelma Cuvage, working in the sand house at the Chicago & North Western R.R. roundhouse at Clinton, Iowa. Her job is to see that sand is sifted and cleaned for use in the locomotives. 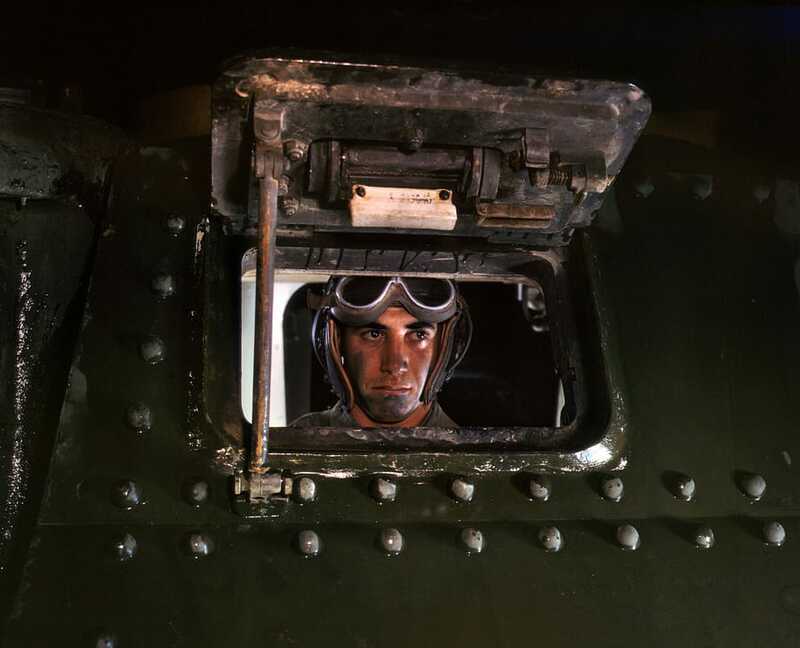 Mrs. Cuvage’s husband works as a guard at the Savanna, Illinois, ordnance plant.” 4×5 Kodachrome transparency by Jack Delano for the Office of War Information.